In the past ten years, I doubt I've spent five dollars at an arcade. 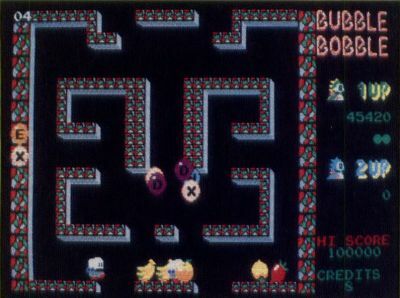 So when it comes to a program like Bubble Bobble from Taito, I can't tell you how it compares with the original. I can say, however, that it's a delightful game. In Bubble Bobble, one or two players control (via joystick) Bub and Bob (two of the cutest brontosaurs you'll ever run into) throughout the 100 screens that make up their world. The two dinosaur friends have many enemies (I don't know why; they're too darned cute to dislike), so they've developed a most unusual defense mechanism: they blow bubbles. These bubbles will trap within them any creature they contact, after which the bubbles will rise slowly to the top of the screen. Obviously, a bubble is an insecure prison for a ferocious creature. If you (as Bub or Bob) are to get rid of the bubble's victim permanently, you must pop the bubble before it bursts on its own. If you wait too long, the angry occupant will escape and zip around the screen at lightning speed. When you pop an enemy-laden bubble, the creature it contains changes into a piece of fruit (don't ask me to explain it), which may be scooped up for extra points. Sometimes special targets appear, which, when run over, give bonus points. Also, special bubbles containing fire, thunder or water, if popped, give additional help in clearing the screen. For example, a water bubble releases a flood on which the dinosaurs can ride, destroying everything in their path. The lightning bubble releases a bolt of lightning that streaks across the screen, blasting all it touches. Other bubbles that may appear contain letters. If you gather enough letters to spell "extend," you get an additional life and move on to the next level. Bubble Bobble's graphics are adequate, though not sensational. 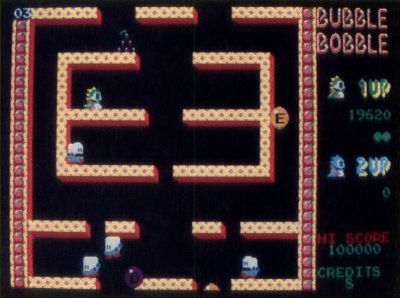 Each screen is constructed of various floors that Bub and Bob, as well as the other creatures, can jump between. There is a minimum of animation, though enough to keep the characters interesting. Perhaps the best animation is the way Bub and Bob waddle about, wagging their tails. It's difficult not to smile. As is typical with Taito's games, high scores are not saved to disk. One has to wonder why they bother having a high-score screen at all. Why take the time to enter your initials when they'll be gone the next time you boot the game? This is only a minor defect, of course, but I can't imagine why Taito doesn't go to the extra effort of including this feature in their games. It would be easy to add. Every once in a while someone designs a program that takes an old standard and cleverly enhances it, creating something original and fresh. Bubble Bobble, although basically a shoot-'em-up, has transcended its genre and is unique and playable. Recommended. 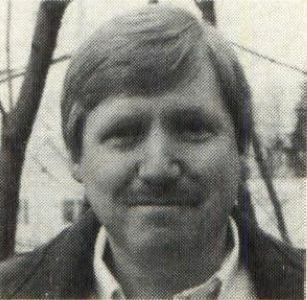 Clayton Walnum is the editor of ST-LOG and ANALOG Computing.